The Star still rises – For the fainthearted . . . In the days before the Internet allowed one to verify or falsify almost anything, there was a tendency to believe what one was told. Unless there were reasonable grounds to distrust what a person said, their word would generally have been accepted. So, whether it was true or not, a lecturer at the LSE used to tell us that the Morning Star, then the newspaper of the Communist Party of Great Britain, owed its popularity in the 1950s to its coverage of horse racing, and to a betting tipster who had a good record of picking winners. Perhaps the lecturer’s story arose from a feeling of antipathy towards the British Communist Party. In the 1970s, it was funded from the Soviet Union and was regarded as an apologist for Stalinism by other groups on the Left. Trotskyites would have regarded with contempt such bourgeois activities as horse racing, and would have considered the encouragement of gambling on races as endorsing the transfer of wealth from the working classes to the capitalist oppressors. The editor of the Morning Star would presumably have argued that the racing columns brought the newspaper a readership wider than that which might have been possible otherwise. Such an assertion would only have brought condemnation from the Hard Left that the Communist Party were “reformists” when real change could only come through creating a revolutionary vanguard of the proletariat. The doctrinal disputes among the tiny splinter groups of the Left would have rivalled those among fundamentalist Christian groups. 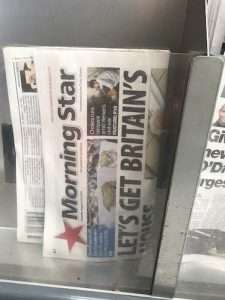 It was always a source of amazement that the Morning Star managed a daily edition, the places where it was available were not plentiful,even in London. The only other Left-wing daily was Newsline, the newspaper of the Workers’ Revolutionary Party, whose credentials were subject to even more questioning than was the Communist Party. Having lived in Ireland for more than thirty years, there would have been an inclination to assume that the Morning Star had gone down with the demise of the Soviet Union a quarter of a century ago. It was a surprise, therefore, to go into a Sainsbury supermarket and see it on sale on the newspaper racks. 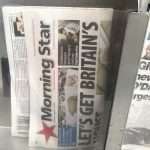 At a time when the circulation of print newspapers is declining rapidly and when the 2017 general election demonstrated that the influence of newspapers such as The Sun and the Daily Mail is a faint shadow of its former self, the Morning Star remains in print. It claims a daily circulation of 10,000 and still supports the Communist Party of Britain (which has survived the collapse of Communism elsewhere). Lacking significant advertising funding, it depends upon donations from readers to continue. The lecturer forty years ago would have probably have been astonished that the newspaper has endured thus far. It is hard to imagine anyone now buys it for the horse racing coverage. I remember members of Left-wing groups rejecting the idea they had been parodied!